Samsung's mobile-based payments system, 'Samsung Pay', is likely to launch in India in the next few weeks. The south Korean corporation is taking steps to ensure smooth entry in the Indian markets early next year, reports SamMobile - a leading publication on all things Samsung. While most of the mobile-based payments solutions rely on NFC (Near Field Communication) technology, Samsung Pay supports MST (Magnetic Secure Transmission) technology; which will allow Samsung Pay to be used with the regular PoS devices. MST has potential to revolutionize the way payments work. Users will have option to store their card details in the special Samsung Pay app. At the time of payment, they'll just have to tap on the PoS machine and authenticate the transaction. The shop-owners who wish to accept payments using Samsung Pay will not have to take any extra step or need any special device. The way MST functions is interesting. An MST equipped device emits a magnetic signal that's equivalent to swiping the regular magnetic-tape based card. The mobile device must be within an inch of the PoS terminal for the technology to work. User's transaction details and card information is all kept secret within the app using 'tokenization'. Samsung argues that the MST technology is just as secure as NFC technology used by competing Apple Pay service. For Samsung Pay, the time is just about right to enter Indian markets. The Government of India is going gung-ho on digital payments under the #digitalIndia movement. The service is already available in Singapore - which became the first country in SE India to get the service. Samsung has also announced that the Samsung Pay service will work on wearable devices like Gear S2 and the latest Gear S3. 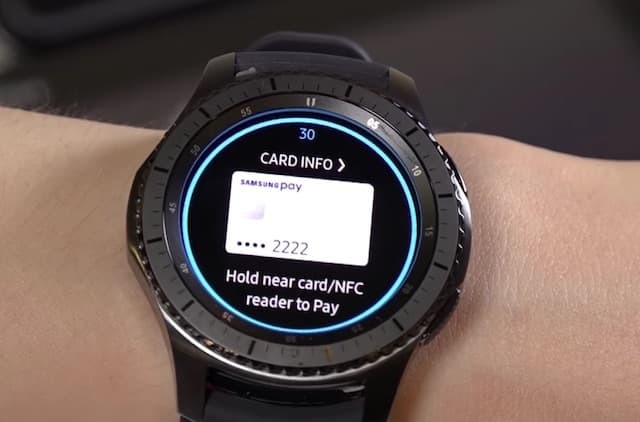 Take a look at following video that shows user making payment with Gear S3 and Samsung Pay service; it's pretty cool! It looks like Samsung Pay will launch in India. Samsung Galaxy S7/Edge phones are getting the Samsung Pay app pre-installed with the software update; which more or less confirms that the service is definitely coming to India!